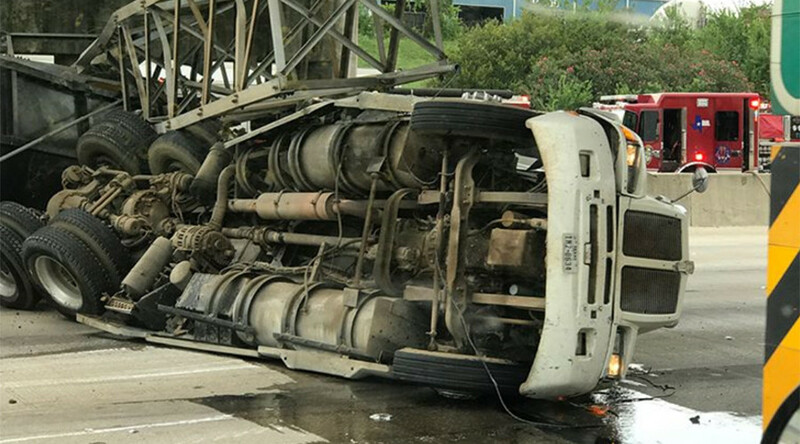 A crash wrecked havoc on a major US freeway after a dump truck jackknifed across the road and smashed into an overhead sign post. Footage which emerged online reveals how one motorist attempted to flag down the truck’s driver before the vehicle struck a gantry above a section of Interstate 610 in Houston, Texas. Thursday’s collision upended the large truck and pulled the metal sign holder into the middle of the northbound ring road, which had to be closed off by emergency personnel. According to ABC13, the condition of truck’s driver is not yet known. Eyewitness Carlos Escobedo said he was travelling down the highway with his father when they unsuccessfully tried to warn the driver that the heavy vehicle’s open-box bed was in a perilous position. A second video posted by Escobedo depicts the moment of impact between the dump truck and the 16-foot-tall sign. As the vehicle approaches an off ramp, its raised carriage strikes the road gantry, causing it to collapse. The truck then flips onto its side before coming to rest under a flyover. Some people commenting on the video have questioned whether Escobedo did enough when trying to warn the truck driver, while others pointed out that no other driver was seen trying to help at all.